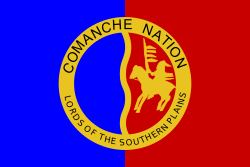 Comanche peoples are Native Americans who lived in an area called the Comancheria. This is where Eastern New Mexico, Southern Colorado, Southern Kansas, all of Oklahoma and most of Northern and Southern Texas are today. There once were as many as 20,000 Comanches. Today the Comanche Nation has 10,000 members, most in Oklahoma (centered at Lawton) and the rest in Texas, California, and New Mexico. The Comanche speak a language of their own, the Comanche language that is related to other Native American ones, called Uto-Aztecan language family. The name Comanche was given by the Mexicans and it was the word the Comanche used to call them, komantsia (enemy, foreigner). But the Comanches' call themselves Numunuu, meaning "human being" or "the People". They were very good warriors and fought the white settlers and army for many years until they gave up in 1875. The woman in the family made the teepees. They gathered wild potatoes, fruits, nuts and berries. The woman in the family cooked, cleaned and made their clothing. The clothing was made out either bear, deer, bison, buffalo, wolves or coyotes. ↑ "2011 Oklahoma Indian Nations Pocket Pictorial Directory" (PDF). Oklahoma Indian Affairs Commission. November 2011. Archived from the original (PDF) on May 12, 2012. Retrieved January 2, 2012. Wolff, Gerald W., and Cash, Joseph W. (1976) The Comanche People Phoenix, Arizona: Indian Tribal Series. Wikimedia Commons has media related to Category:Comanche. This page was last changed on 2 January 2019, at 19:19.